Arranged by the School of History, Anthropology, Philosophy and Politics at Queen’s, the 2017 Wiles Lectures will be delivered by Ms Miri Rubin, Professor of Medieval and Early Modern History from the School of History at the Queen Mary University of London, on 17-20 May 2017. On the theme: ‘Strangers into neighbours: dealing with diversity in medieval European cities’, Professor Rubin will explore the challenges and opportunities, responses and experiences associated with the settlement of incomers in urban communities. She will do so by examining the ideas and actions that medieval towns and cities took as they settled newcomers. Cities aimed to attract strangers - labourers, artisans and experts, men and women - but also to keep their communities safe, healthy and thriving. The lectures cover many regions, from the British Isles to Central Europe, and communities ranging from those of capital cities to inhabitants of market towns. Miri Rubin will consider the responses and solutions offered by townspeople to newcomers in the period of greatest growth and promise, around 1100, and show how the Black Death (1347-50) and the recurrent mortalities that followed, affected the willingness of townspeople to make strangers into neighbours. The relevance of past experience of this question to the present has never been more pressing. The terms of the Wiles Trust are carried out by inviting scholars who have conducted research in a suitable field to deliver – normally four – lectures called (The Wiles Lectures) which relate the lecturer's research to the general history of civilization or bring out the results of reflection on the wider implications of more detailed historical studies or which communicate the revised reflections of the lecturer on some major work consistent with the above and which he or she has produced at an earlier period of his or her career. 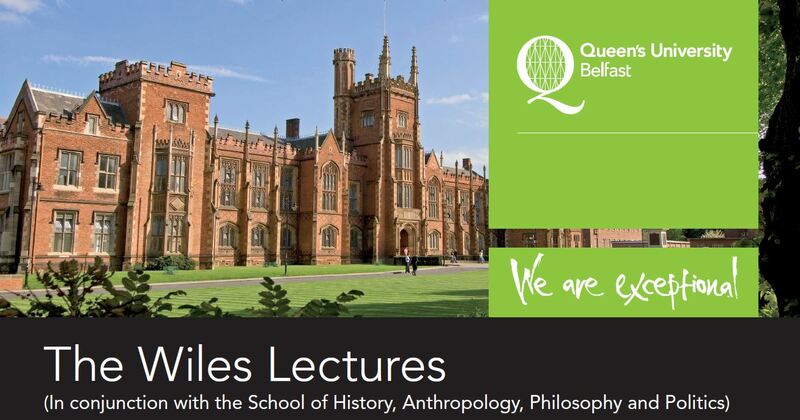 The Wiles Lectures is one of the most prestigious set of history lectures given anywhere in the world and, in keeping with the wishes of their benefactor, Mrs Janet Boyd of Co. Down, they are designed for members of the general public as well as the specialist. These are public lectures, open to all with an interest in the subject and registration is not required to attend. Professor Rubin will also lead a Postgraduate Workshop on using Medieval Sources, on Thursday 18 May, 10am-12pm in The Graduate School. Contact James Davis for details. For more information on the 2017 Wiles Lectures click here or contact Susan Templeton.